· Rahu and Jupiter will be in Leo and Saturn and Mars in Scorpio; which is the combination of opposite forces. 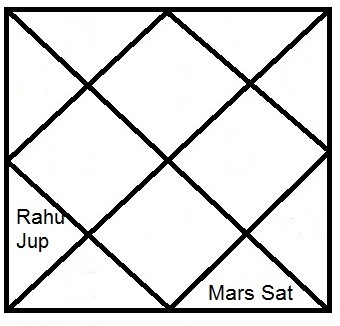 · Both combos are in fixed signs and quadrant to each other. · One combo is in Fire element and other combo in Watery element. These combos would definite brings challenges and strong impact that will affect all lifes collectively as well as individually. In mundane effect, major political power would re-align to combat with inhumane and terrorist activities very strongly. Since Jupiter is completely afflicted, mass death could happen either due to natural calamities or due to terrorist activities. You would be highly frustrated by obstacles in your projects and may feel that other people are intentionally thwarting your efforts, especially authority figures and supervisors. You would find hard to maintain cordial relation with your immediate boss. He would be suspecting you in your work without any reasons. Focusing on what is most important will help your from impeding your progress. There is strong possibility of change of place. If in personal horoscope there is weak period than one can face lot of health problems. It is the period to take all precautions regarding health. There’s great potential for hard work and productive results, but this time has its definite frustrations. You may be challenged to develop a steady and organized approach to your physical activities and learn to pace yourself according to the demands of the situation. Exerting too much force can have unpleasant consequences, especially if it is a reaction to something you dislike. You have to focus on the activities at home and relationship with your spouse. You should select friends with greater care, and those who really are not close to you may fade into the background or may no longer be a part of your circle. Your challenges are more towards your inner feelings and likings, at home rather than outside. You would have least negative impact of these planetary positions and you can make out productive results with hard work and dedication. Enthusiasm creates a positive outcome. The time is right to begin new initiations. You have an immediate response to personal challenge, being more forceful than you’re aware of, and need to watch taking the comments of others too personally. This is best period to fight competitions and get success. You may be lucky and can take risks you normally wouldn’t, but should avoid gambling unnecessarily with your resources. You should have positive thinking to attune easily to the people and the environment around you, which likely enhances your position in any negotiations. Apply yourself to resolve longstanding or complex problems, since your mind generally is more open than usual to finding a solution. An indirect and soft approach in your communications can bring success. Your long distance traveling could bring favorable and productive outcome. You tend to show more confidence in whatever or whomever you pursue. You would be more concern with your future and children. In this period you can display your best abilities very easily and boldly. Only things you should follow; don’t create panic and make decision patiently. You can face lot of disappointment and frustrations. If you’ve been holding in your frustrations, they may all come to the surface now and you may be inclined to throw more frequent temper tantrums. But you’ll often find yourself in situations that are inappropriate for this behavior therefore learn to deal with your frustrations in a more constructive way. Pay close attention to your health as you’re carrying more inner stress. If you have family history for heart problems then you must get your all test done before this period. If there is dispute related to properties, you should try to resolve them with cordial behavior. You are more bound to be more concern with the relationship with your spouse. There could be health issues to spouse. If there are fundamental issues previously with relationships then this period could bring legal proceedings to end up completely. There could be lot of outflow of money and matters related with loans could be cause of lot of burden and agitation. There could be very less support financially as well as morally from close social circle in the time of need. Be especially careful when handling tools, machines, including your kitchen knife. You would feel bonded and agitated in the matters related to joint family and to obey the rules of family. Financially this period is favorable and you can have major benefits through properties. You could have gains from unusual resources. In the matters related to marriage, there could be exceptional delay without any reasons. Marriage talks will not move forward and you would feel some unseen hindrances and obstacles. Respecting parents and elders would be the key to manage the life more wisely in this period. During this period of time, your desire for personal freedom and new experiences will be intense and you’re likely to spend most of time extremely restless and experimenting. Due to overconfident and dominating attitude, people may try to make distance with you. Taking too much risk and adamant decision making may lead to lose faith in close circle. If worked intelligently on practical grounds taking calculated risks, keeping away with arguments, there is lot of scope for grand success in career. This is favorable period for those who are planning to move at distance place or want to move abroad. Confusions, delays, non-guidance are the major obstructions and challenges in this period. You have to think and move alone. This is weak period for parents as well for themselves at health affairs. An attitude to forgive and to forget helps to loosen the knots and memories that bind you to the past. There could be lot of expenses on children and could be the cause of concern. It would be great beneficial to take dips in holy water and join festival related with it like Kumbh Mela in Ujjain and Haridwar. This is favorable period for assets development and financial benefits from properties. In this period where property market is at decline all over world you can make out benefits of it. Your dream home wish could be fulfilled. Be cordial with colleagues and elders. You’ll be quick to defend yourself or promote your own agenda. Use this time to grow and to acquire things and fulfilling your wishes. You must be careful and alert with your food habits as you can face seasonal health problems. This is the period to work on the ideas you are holding for yourself. You would be more confident and responsible and it will enhance your career. There will be lot of pressures than usual. Pressure sometimes makes you exaggerate your abilities or go past boundaries that you have set for yourself. Enjoy your work and struggle yourself to give your best. You would be highly appreciated for your execution of projects. Matters related with relationship and marriage would be stressful due to overburden at office. Keep yourself healthy by working more physically rather than mentally. Health should be the prime concern in this period. Schedule your timetable with regular physical exercise. In this period strong “Astha-Laxmi” yoga is activated and you can have huge earnings with least efforts. There could be ambiguity and confusions in decisions making, still if you have fix aim and have clear vision of your path then you are bound to make substantial success. Take all steps to maintain good health as it could be major obstacle in your career. Follow the righteous path and deeds and respect the ritual and tradition of the family. This predictions are very helpful. Vastu vidhya have a best Astrologer for all astrology services. online Astrology , Face Reader, Horoscope matching Services, Astrologer in Indore , Astro Guru.